A new session of this popular arts-based program will be starting again in January. What does it mean to be an elder? Is it simply a process of growing older or does it require a conscious choice? How do we take our place as elders in community? As elders, what can we offer our community? 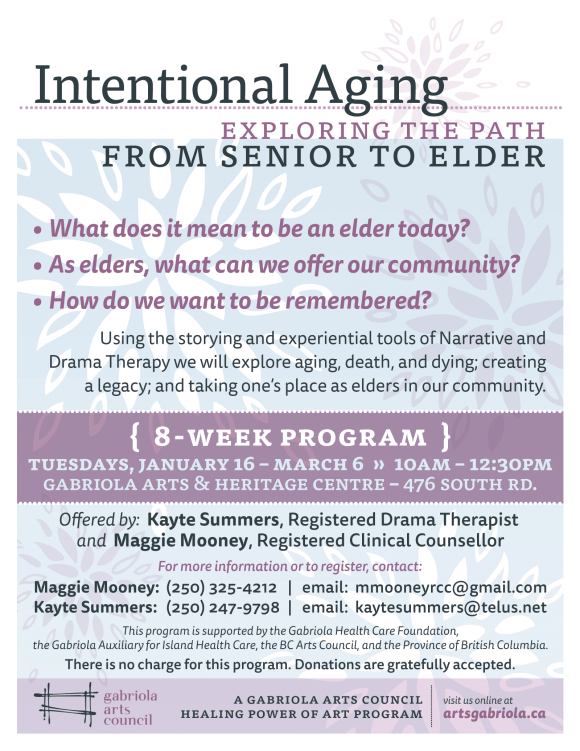 Using the storying and experiential tools of Narrative and Drama Therapy, we will explore aging, death, and dying; creating a legacy; and taking one’s place as elders in our community. Participation is free and open to all Gabriolans. There is no charge for this program. Donations are gratefully accepted. This program is supported by the Gabriola Health Care Foundation, the Gabriola Auxiliary for Island Health Care, the BC Arts Council, and the Province of British Columbia.